This hands-on workshop is perfect for those who can’t get enough mochi to munch on! About Kaori Becker: Growing up as a “hapa” (half-Japanese) woman in the Bay Area, Kaori was surrounded by her mother Yukiko’s Japanese home-cooking. When Yukiko told her that many years ago Kaori’s grandmother owned her own ramen shop in Fukushima, Japan, Kaori decided to dive deeper into her roots through cooking ramen. UPDATE: Due to popular demand, we have added 10 additional participant spots! Register ASAP before they sell out! In her next cooking workshop at the Center, LA-based food writer Sonoko Sakai will show you how to make curry from scratch, using fresh whole spices and seeds. Participants will make their own spice blends and make a curry brick that is free of artificial preservatives or food coloring. Workshop participants will then make a chicken and vegetable curry over sprouted brown rice and home made Fukujinzuke tsukemono relish – pickles of the seven lucky gods. Don’t miss your chance to cook with Sonoko, who has published two cookbooks with a third on the way in Fall 2019! Sonoko Sakai is a cooking teacher, food writer, author and producer based in Los Angeles and Tehachapi, California. She was born in New York, and raised in Tokyo, Kamakura, Los Angeles, San Francisco and Mexico City. Sonoko has published two cookbooks, The Poetical Pursuit of Food: Japanese Recipes for American Cook (Potter) and Rice Craft (Chronicle Books). Rice Craft was Amazon’s Best Book of the Month in July of 2016. Sonoko’s third cookbook titled: Japanese Home Cooking: Authentic Recipes for the Everyday Cook will be published by Roost Books in the Fall of 2019. For more than 20 years, Sonoko worked in the film industry as a film buyer and producer traveling around the world while freelancing as a food writer. In 2009, Sonoko decided it was time to leave the film industry. Sonoko went back to Japan to study noodle making as a way to restore her energy. She fell in love with soba (buckwheat) and the rest is history. 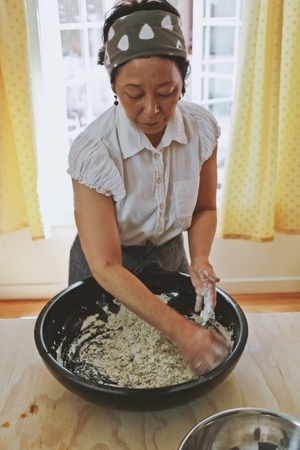 Sonoko has taught at cooking schools, community centers, farmers markets, universities and other institutions around the country, including the Bread Lab at WSU, King Arthur Flour Baking School, and Anson Mills and more. Sonoko has also worked as producer and director for Cool Japan and other events to promote Japanese food and culture here in the United States and abroad. In 2011, Sonoko received a seed grant from Anson Mills to start a community grain project in Southern California with a mission to diversify the way we grow food, deepen our appreciation for food and culture, with grains and plants at the heart with the ultimate goal to restore the health of our planet.